This book is the definitive study of how a small group of dedicated imperialists took over America’s foreign policy. Loaded with footnotes and bibliography, it follows those who made the current disaster in America’s relations with most of the world. Chickenhawk academic intellectuals in Washington think tanks, with visions of military glory, knowing little of the outside world, and without military or business experience, generated the “go it alone/international law be damned” warfare agenda. The book analyzes several disturbing trends: the absence of international business input into war policies (and the consequent loss of American brand-name goodwill in much of the world); the new influence of America’s religious fundamentalists (who look favorably upon Mideast chaos as hastening Armageddon); the intimidation of intelligence officials and the media; and the silence of major American institutions in the face of the administration’s lies. 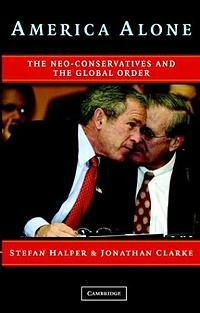 The authors remind us that the neoconservatives wanted a military confrontation with China before 9/11. Although many are accused of having an Israel First bias, it’s not fair to say that is their only concern. Their Wolfowitz Doctrine was to take down any rising power in the world. Most of them also supported the Kosovo war. Indeed, Bush waffled when that war started, until Wolfowitz rushed down to Texas to persuade the governor to support it. Neocons are also “not at all hostile to the idea of a welfare state,” according to their godfather Irving Kristol. In fact, they are the ultimate purveyors of the warfare-welfare state. At the Cato event mentioned above, columnist Robert Novak commented, “There is nothing conservative about neoconservatives. Indeed, you’ll see [former Democratic Senator] Scoop Jackson’s photo on their walls, not Ronald Reagan’s. One chapter delves into the “Neoconservative Network” of interlocking institutions and its 1998 letter to Clinton urging the invasion of Iraq. Signatories such as Elliot Abrams, Richard Armitage, John Bolton, Douglas Feith, Richard Perle, Peter Rodman, Rumsfeld, Wolfowitz, and David Wurmser were all given key foreign policy positions by Bush. The network’s leading institutions are the American Enterprise Institute, the Heritage Foundation, JINSA (Jewish Institute for National Security Affairs), Center for Security Policy (Frank Gaffney), Hudson Institute and Bill Kristol’s Project for the New American Century. Their funding comes from defense contractors and conservative groups such as the Bradley Foundation, Olin Foundation, Sarah Scaife Foundation, Smith Richardson Foundation, and the Castle Rock Foundation (supported by the Coors family). Bill Buckley has now stated that he would have opposed the war if he had known the truth, but National Review would not publish any antiwar conservative writer and thus made neocon objectives respectable on the Right. Another network document of interest is 1996’s A Clean Break, prepared by JINSA, Richard Perle, David Wurmser, Douglas Feith and other leading neocons. It argued that Israel should abandon the Oslo peace process and any negotiations of land for peace, stating that “Our claim to the land  to which we have clung for hope for 2000 years  is legitimate and noble.” I should note that Feith, in his key policy planning position over the Pentagon, is also widely reported as the author of the plan to dismiss all the Iraqi soldiers and government officials, which has contributed so much to the chaos in Iraq. The book also says he blocked the State Department’s planning for a civil administration to be ready right after the war. Correspondent Jim Lobe notes that Feith’s former law partner is an attorney for Likud settlers on the West Bank. Many experts think that he promotes Sharon’s wants, namely that Iraq be debilitated by chaos as a way of keeping it weak. The authors explain that initially neocons could not sell their agenda to President Bush and were “just another lobby trying to gain access.” 9/11 was their godsend, after which their network, thanks to VP Cheney’s having put so many of them in key government positions, could really push its agenda. They also gained a tremendous increase in their strength (particularly in Congress) from alliance with the Religious Right. “Building upon the biblical foundations for an apocalyptic confrontation in the Middle East, the Christian Right came to support the neoconservative agenda concerning Israel,” says the book. Another chapter details losses of freedom under the Patriot Act, a good synopsis for readers who may have forgotten or become confused since it first passed Congress. It highlights the removal of judicial restraint on police power and the increase in presidential authority. With unending war on the horizon, the authors write, “At what point does the government cease arrogating to itself more and more power (over Americans’ civil liberties). In conclusion, the authors explain how fighting terrorism should be based upon the lessons learned from other nations. For example, England finally neutralized IRA terrorists with political action and compromise after generations of war. They argue that we need the active help of other nations. Going it alone and antagonizing much of the world only makes us less safe. Epilogue: The word “neoconservative” is losing respectability. Midge Decter, wife of Norman Podhoretz, editor of Commentary, and a director at the Heritage Foundation, spent the first minutes of her first recent speech at the Philadelphia Society denying that she, her husband, her children or her grandchildren were ever neoconservatives. Yet Google shows 834 links of her name to the word and 2,750 for her husband.